It's Friday which means I can sleep in tomorrow. Oh wait, I have twins and Rory has a golf tournament, so that means no sleeping in for me. Ugh. But at least it is the weekend. We have some great things planned. Hurry up work day and be over. Today I am linking up with Karli and April. One. I can't stop listening to JT's Can't Stop the Feeling. It is just so good and makes me want to get up and dance. I love me some Justin Timberlake. Two. The diaper pail search didn't last long. 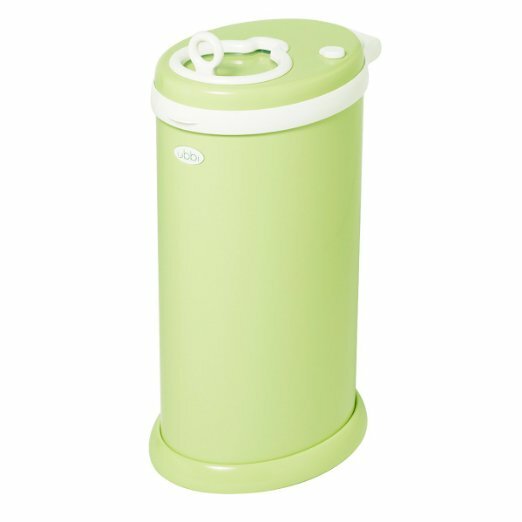 I researched a ton yesterday to find something to replace the stank and I found our new diaper pail. Enter the Ubbi Steal Diaper Pail. You don't need special bags, it locks (the girls get into everything) and it keeps the stink in. It should arrive on our doorstep in two days. Thank you Jesus. Three. I have been on the search for car mirrors for the girls. Sure we get to do forward facing in about 7 months, but the girls need the distraction, I want to be able to see them and we have a long car ride coming up. I researched everything (heavily) as I always do and found these to fit our needs. Does anyone have experience with them? They fit around the headrests, are soft, the mirror is clearer than most and they seem to say on the headrests where a lot of them had reviews that they hadn't. 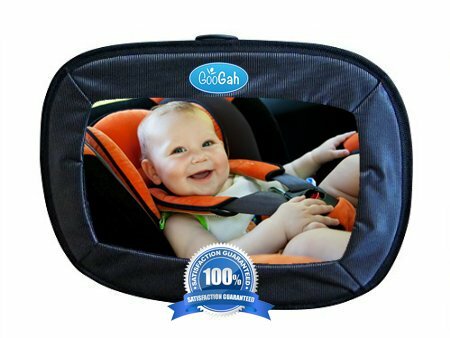 So we went for the Googah Baby Car Mirror Extra Large. Let's hope we are as satisfied as the reviewers are. Four. Busy weekends. I have lunch with my twin mom group today, followed by my custom Strange Bikini appointment, dinner with my mom and sister and ending the day with Picasso and Wine (painting and wine). I am soooo excited about my day. What I am not excited about? Not seeing my girls after 10 am today. Tomorrow I am watching the girls until my parents come up to watch them since we are going to dinner, drinks and the Aces baseball game (pending weather) to celebrate my friends graduation from nursing school. Busy fun weekends are the best! Five. I have been searching for white pants (that aren't see through), but haven't found any that I have liked or are not see through. But in the midst of it, I found the most comfy pants for work and I have to share them with you. No, it is not a sponsored post. I just love them. They are soft, stretchy and fit like a glove. 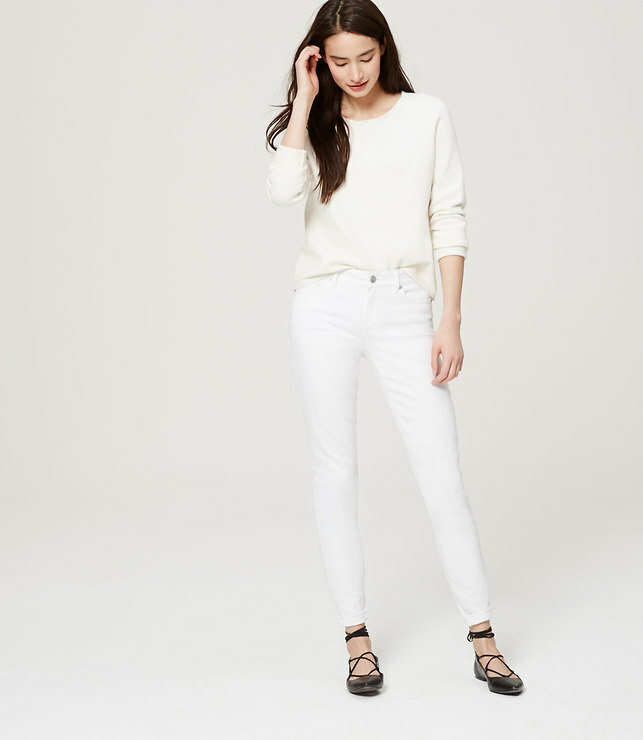 Some bloggers have said Loft has some great white pants and I am considering these. We don't have a Loft here anymore, so I would be buying blindly and sending back what I don't like. Have any of you tried any of these out? Good to know because I worry about my underwear showing through. Have a great weekend as well! Love all of the clothing finds! Looks like your weekend is going to be full of all kinds of fun even if there's no sleeping in tomorrow! I really hope the white jeans work out for me. I can't wait to get them. Have a great weekend! Yay for friday!! Sounds like you have a great day planned today and your weekend sounds pretty fun too. Love all of the clothes. You can't go wrong with any of them. I just can't do white pants. Between both of my kiddos they would be destroyed minutes after putting them on. But I want to see what you choose. I worry about white pants getting dirty too, but I can wear them to work and when I go out without the girls. I need some stain resistant ones haha. Have a great weekend! I'm definitely looking into that diaper pail. I just have trash cans in their rooms and I admit they stink!! I've got a car mirror similar to that and it's perfect!! Love those pants! Sounds like a great weekend planed. Have a great day! I really hope the diaper pail is a good choice. We bought it yesterday evening and it should be here by Saturday. Have a great weekend! I buy a lot of LOFT because their stuff just fits me well. 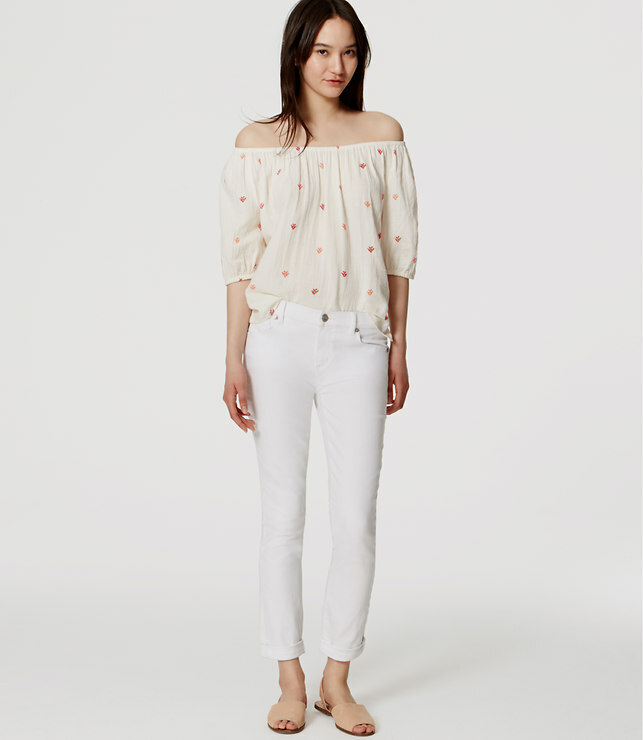 I have the cuvy skinny jeans in white and they are my favorite jeans for summer. I LOVE them. 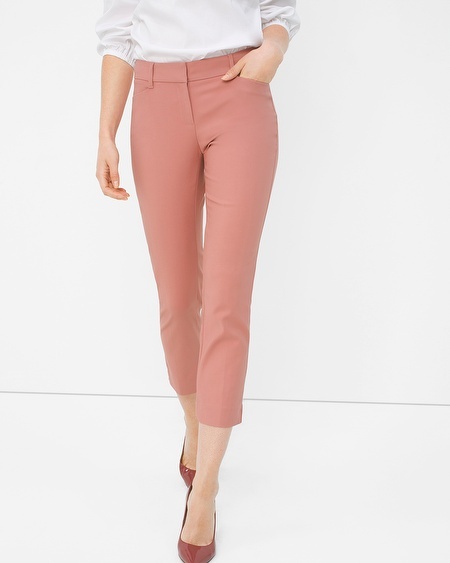 I also have these http://www.loft.com/bi-stretch-riviera-cropped-pants-in-marisa-fit/397028?skuId=20263584&defaultColor=9000&colorExplode=false&catid=catl000014 and they are great for work. Not sheer at all. Good luck & happy Friday! Oh thanks for sending that link.I looked at those as well. Maybe I will have to snag them too. Have a great weekend! I have the curvy skinny ones too and love them. The marisa fit is my other go to when I had to wear nice clothes to work. Have fun painting tonight. I have not done that in a while. Love that everyone agrees on the pants and jeans. I think the curvy ones will be best for me since I have a booty. Thanks for the input. I love the painting and have 4 at home already and this one is a surf wave so I can't wait. Have a great weekend! can't wait to hear how that diaper pail works! also, I'm loving JTs new song too! Just can't get enough of it! Happy weekend! I have been listening to his song on repeat. I love it. I try to get my girls to dance to it, ha. I will let you know what we think of the diaper pail. It was pricey so hopefully it works. I found a pair of cropped Paige white jeans last year at Nordstrom Rack that I love and aren't see through! I am heading to Nordstrom Rack today, so I will look into it. I know it was a year ago, but you never know what I can find. I can't stop listening to JT either! So good! Have a Great weekend! I even dance in my car too it. Ha. I can't wait for him to tour. Have a great weekend! So the diaper pail thing. If the one you ordered doesn't work out, we opted to go with a regular SimpleHuman trash can and it worked amazingly. If you need another option, let me know and I can send you the link to the trash can we got. Sounds like you have a fun weekend ahead! We haven't gone out in almost a month and my parents offered to watch Mila tomorrow, so we're heading out to dinner and I CANNOT wait! I need it SO badly!! If you get Loft jeans, let me know how you like them. I always shop at Loft, but I only buy tops. I'd love to try their jeans once I can actually fit in them again, haha. Enjoy your weekend!! So far the diaper pail is ok. The girls can get it open so that part isn't good. They know how to unlock it :/ I just realized we have a Loft here, so now I want to go in and check out their selection in store. I will let you know what fits and what doesn't. So glad you got a date night. That is awesome! Haha, I know right? I haven't stopped listening to JT's song all weekend long. I think my husband is over it now. Ha. Hope you had a great weekend! Loving the JT song too! I love any songs that have a good beat. Ben loves dancing too ;) Hope the weekend was absolutely delightful! His song is the best! I am trying to get my girls to dance to it with me. Hope you had a great weekend as well. I hope you had a great weekend! I'm going to have to check out the diaper pail you recommended. The one we have is AWFUL! Yes we had to get a new one. It was so bad. I can't believe how bad they get. Or I can, but hate how they smell. I think I have both the modern kick crop and curvy skinny and love them! Oh good to know. I can't wait to try them on! I would love to hear your personal review on the diaper pail. I'm on the hunt for white pants too. I would love to hear if you find some that you like. We are a couple days in and the only thing I haven't liked is the girls figured out the locking mechanism and try to open it. Otherwise so far we like it. I will let you know in a few weeks how it is doing.